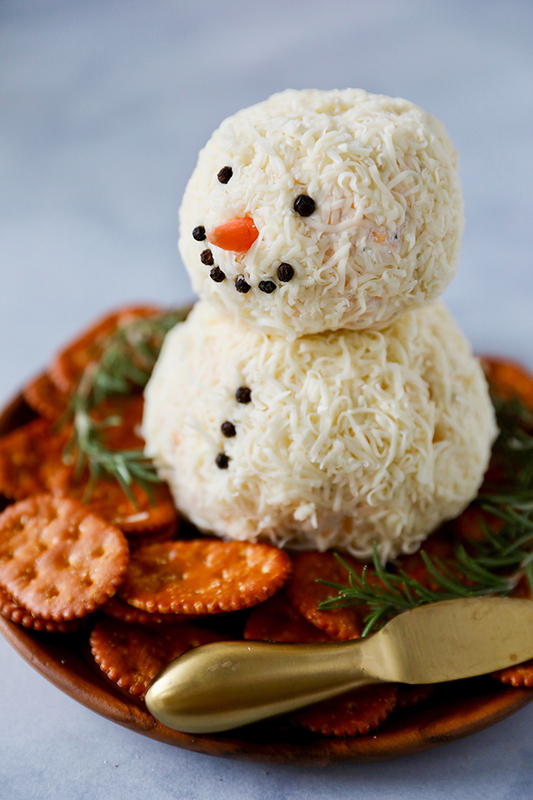 For a super easy Christmas Appetizer try this adorable homemade Snowman Cheese Ball. 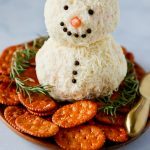 With so many parties and events during the holidays, I’m always looking for a fun and easy Christmas appetizer. 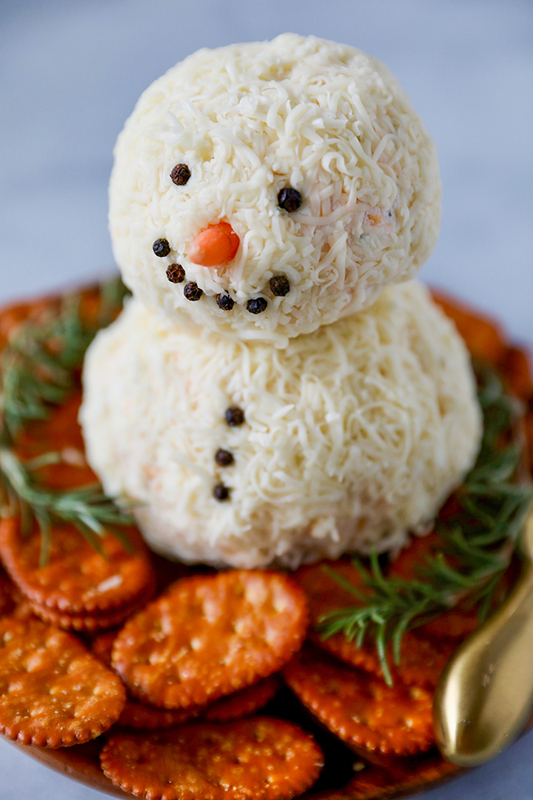 This cute little snowman is going to be the hit of any party! 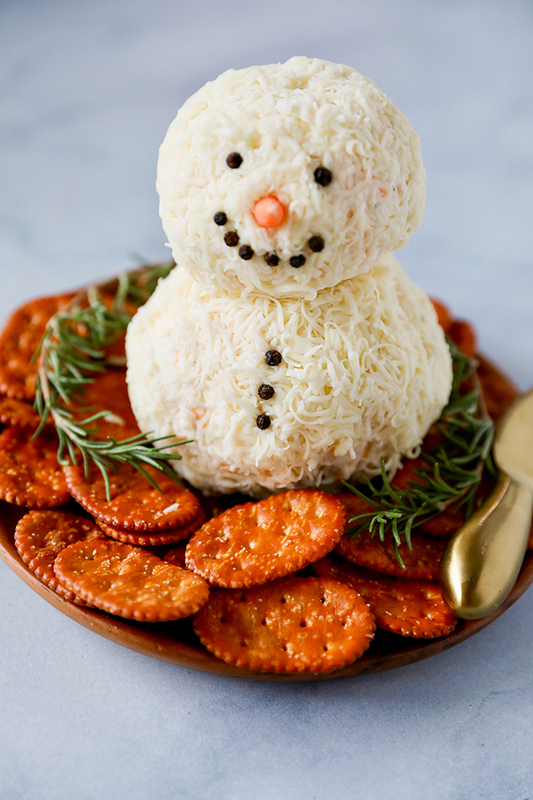 A cheese ball is the perfect appetizer for holiday parties. You can make it several days ahead and assemble it right before the party. 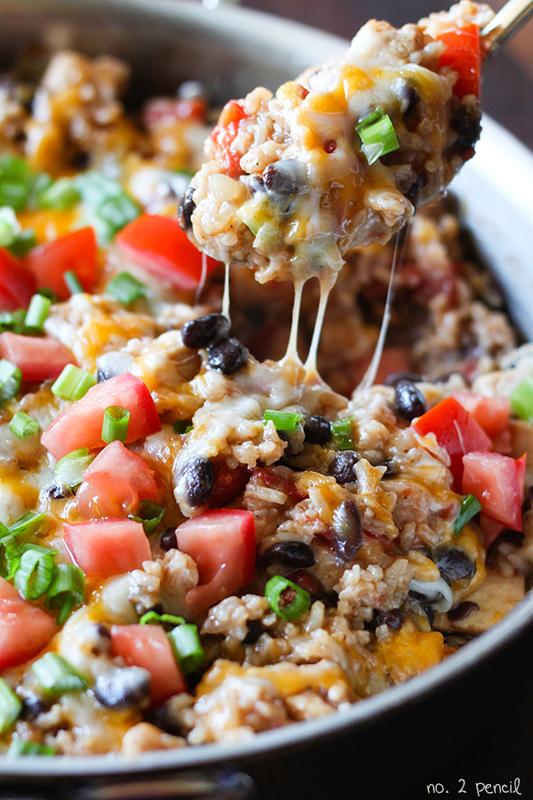 Start by mixing the cream cheese, cheddar cheese and ranch seasoning in the bowl of a stand mixer. It’s important to have the cream cheese and cheddar cheese at room temperature so they blend well together. 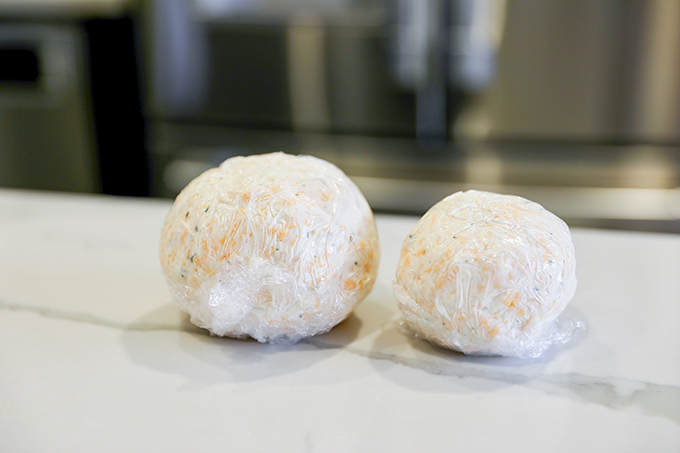 Then divide mixture onto plastic wrap and form balls. I used about 1/3 of the mixture for the snowman head and 2/3 of the mixture for the body. Refrigerate for at least four hours and up to 3 days before. 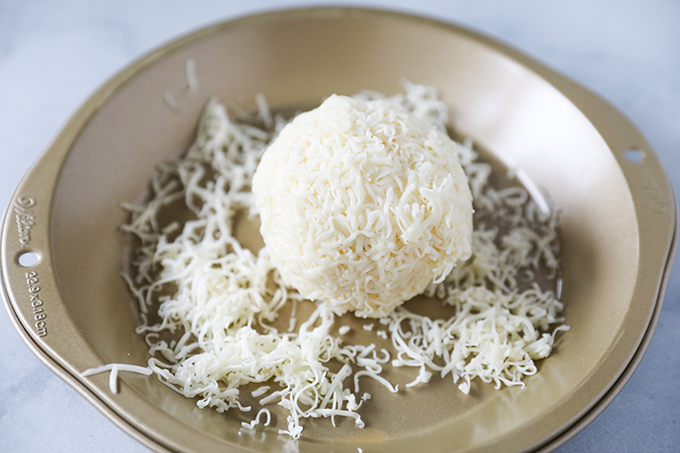 Once cheese ball is firm, press finely shredded jack cheese onto cheese ball. Place snowman head on body. Use the tip of a baby carrot for the nose and black peppercorns for the eyes, mouth and buttons. Let cream cheese and sharp cheddar come to room temperature. In the bowl of a stand mixer fitted with a paddle attachment, combine cream cheese, cheddar cheese and ranch dressing mix. Divide cheese mixture and form one smaller cheese ball for the head and one larger cheese ball for the body. Transfer cheese mixtures to two separate sheets of plastic wrap. Refrigerate for at least 4 hours, or overnight. Can be made several days ahead. Right before serving, press shredded cheese into cheese ball. Place on a serving plate and place smaller cheese ball onto larger cheese ball. Slice the tip off of a baby carrot and press into cheese ball to make a nose. Use whole peppercorns for mouth, eyes and buttons. Serve with crackers. Cheese Ball can be mixed and refrigerated up to three days before. 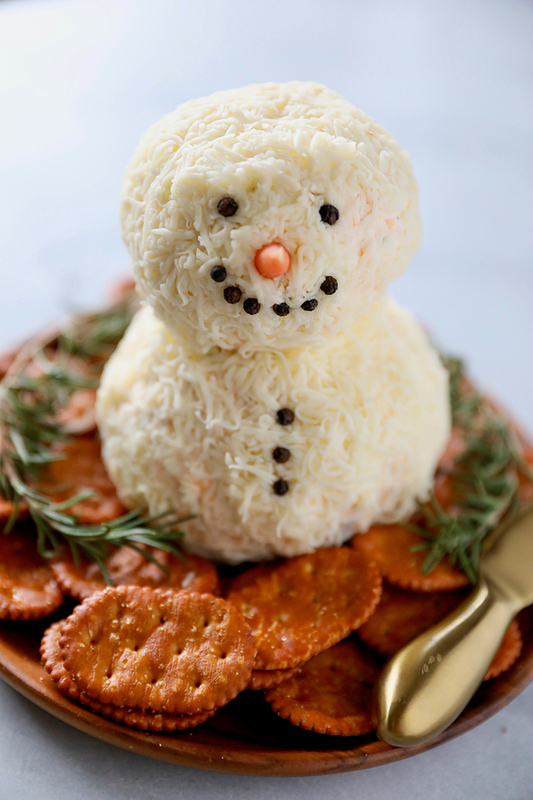 Add jack cheese and snowman decorations right before serving. Thank you so much! Love that idea!